Karel Capek was born in the Austro-Hungarian Empire, but his writing career coincided almost precisely with the period of the first Czechoslovakian Republic, between World Wars One and Two. He was a close associate of the Czech president Masaryk and thus at the crossroads of all the developing political theories of the time, from Communism to Fascism. These new ideas are often reflected and satirized in his works. Best known perhaps for coining the term "robot" in the play R.U.R. (Rossum's Universal Robots), he was never afraid to deal with dark, dystopian perspectives. These sort of visions predominate in the novel War With the Newts, originally in Czech, and thus known by various titles in the many languages that it was translated into. Capek's newts originate on Earth, in the Pacific near Indonesia, where they are discovered and quickly bred and exploited by humans, who also experiment on them scientifically. Soon they proliferate to form a slave race that performs all sorts of work on and under the water for their masters, who scorn and mistreat them. Eventually they revolt, at first secretly through sabotage and clandestine activities, and eventually in an open conflict. Because they quickly neutralize human navies, far less at home in the water than they are, the advantage swings to their side and they begin to aquaform the Earth into an ideal liquid habitat for them, leaving only a few grim islands where the surviving humans in turn become their subjects. This work, which was rapidly recognized as a political allegory, parallels Wells's War of the Worlds and Food of the Gods in many ways, especially in the disorganized and pathetic reactions of human beings to the "invaders." It serves as an implicit influence for all sorts of modern sci fi works, from the Planet of the Apes movie cycle to such B-movie examples as Empire of the Ants and more thoughtful efforts like Alien Nation and District Nine. Even the recent zombie cycle The Walking Dead can list Capek as a distant relative. 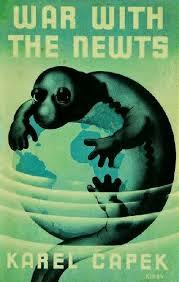 For us, War With the Newts offered both rich biological source material and opportunities for social commentary. We started in our universe with the postulate that evolution on alien worlds could be very different from that on our planet, which was shaped by various cosmic accidents that could take place in varying ways in other systems, or not at all. Why not a planet where the evolutionary thread was never interrupted by a Permian extinction, so that amphibians became the alpha life form? There is nothing to prevent an amphibian life form to develop with all the manipulative limbs of a human -- or even more. Of course, the approach to fire might be radically different or even absent, but undersea volcanic sources could even furnish the beginnings of a metal technology. Furthermore, being amphibians, newt-like creatures would not be excluded from exploring on land and accessing many resources available to mammalian or other evolutionary groups. Our newts in the Forlani Saga universe come from the watery world of Talini, where they developed advanced organization, communication, and technologies. They were not a space-faring race until they experienced First Contact with neighboring planetary civilizations and though they do not excel in space transport, they can travel as passengers with relatively little trouble between systems. There are numerous parallels for this on our own planet, from Filipino sailors serving on supertankers to African bush pilots of aircraft that their own nations could not build (at least not in the present economy). Moreover, their adaptability to many divergent liquid environments allows them to become valuable "manpower" on many worlds, fostering a remittance system to their own relatives and the possibility of sooner or later having fleets of their own. In Life Sentence, the reader first encounters Talinians in work teams on the aquaplanet Song Pa, where they engineer jobs for the resident squid-like inhabitants who possess a higher tech level. Disguising his identity as an indentured human worker for the Song Pai, our protagonist Klein toils alongside Talinian crews in his daily duties. Their mutual communication takes place via electronic tablets, since humans, Talinians, and Song Pai have vastly diverse vocalizing systems that render sound communication virtually impossible. Klein exchanges favors with a Talinian nicknamed Fatty, who provides valuable information to the Earthman and later delivers news of his survival to Entara and other friends on Forlan. This allows them to re-establish contact with him just when he most needs their help, for his pursuit of revenge leaves him severely injured and near death (again). 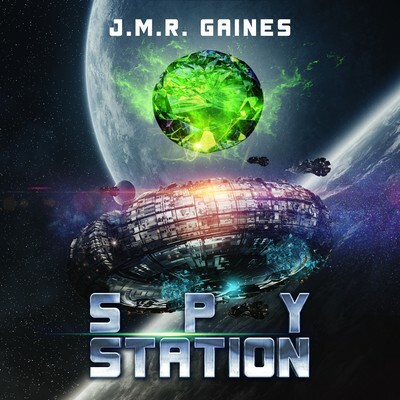 In the second novel of the series, Spy Station, Entara and her eldest daughter Ayan'we, delegates to the Zonal Peace Conference form a strong alliance with the chief Talinian delegate, the wise old Kee'ad of Tionar. They bond with other species, as well as AI individuals of the Robotic Guild, to campaign for peace between bellicose factions, as spies for the warmongers attempt to subvert the conference for their own purposes. Tionar also becomes an important friend for Ayan'we as she faces difficult choices in her private life. At the end of the novel, he accompanies the Forlani who leave the space station and helps Ayan'we reach Earth, where she plans to solve her life problems with Klein's daughter Amanda. Other Talinians are already busily working to salvage civilization on our world, which has been decimated by a plague that nearly exterminates the natives. Henceforth, human Earthlings may not be exclusively dominant, but may share their planet with Talinian and robotic colonists. Our Talinian newts are one way of exploring the possibilities of evolutionary plurality. Their approach to conflict will be quite distinct from human "normalcy." Their priorities in existence will offer relativistic alternatives to the ones we take for granted. The possible permutations of a water-based life form are unlimited and can make contemporary speculations like Waterworld or Aquaman quite limited in comparison. Just imagine how the very notion of place takes on whole new dimensions in the eyes of an amphibious creature that was never framed by human precedents! Fun at the Book Fair at Cityspace in downtown Charlottesville. We'd like to thank all of you who came out to get your copies of Life Sentence and Spy Station at the Charlottesville Book Fair yesterday, and a special welcome to our new members: Martin, Jean, Ben, Bob, Dave, Crystal, Emily and Becky. It was a fine event, expertly organized by Carolyn O'Neal of the Blue Ridge Chapter of Virginia Writers Club. We were especially happy to say hello again to some readers who had already enjoyed Life Sentence and who shared their admiration with us. Recently our short story "Whipping Boy" was published in the Creatures, Crimes and Creativity 2017 Anthology. It deals with a time in the relatively near future (22nd century), when our loaded prisons begin to accept substitutes, first typical humans and then later clones, for criminals rich enough to pay the System to avoid serving out their sentences in person. When one clone begins to realize he is different from some of the other prisoners and to ask thorny questions, fellow inmates begin to reveal the bitter truth. Will they tolerate this naive, but curious newcomer or subject him to prison discipline? Will he ever live to get his own tattoos? The anthology is a limited printing, but we plan to republish this story with others in a collection. On Amazon Kindle, you can get either novel for $2.99 or both for $5.98. The printed books are $18.50 and $12.00 respectively. Treat yourself to a great reading experience, too. This is the time of year in Iceland, the world's top country for literacy and rates of reading, when people stock up on books for their long winter nights and we should imitate that example.